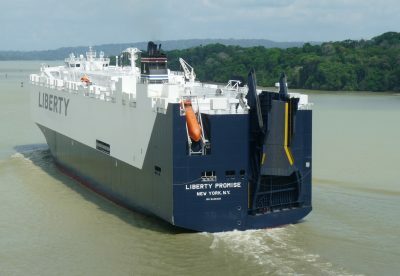 On 8 August, the Liberty Passion docked at the port of Livorno, and on 2 September, the Liberty Promise. On 9 October, they will be followed by the Liberty Pride. The three ships will then return to Livorno, successively, on 10 November, 15 December and 12 January. These are enormous Ro/Ro ships (Roll-On/Roll-Off – vehicle transporters), 200 metres long. They have 12 decks, each one capable of housing 6,500 automobiles. However, they are not, in fact, carrying vehicles, but tanks. They are part of a US fleet of 63 ships belonging to private companies who, on behalf of the Pentagon, are constantly transporting weapons in a global circuit between ports in the United States, the Mediterranean, the Middle East, and Asia. The main Mediterranean stop is Livorno, because its port is connected to the neighbouring US base of Camp Darby. During a recent visit to the Florence daily ‘La Nazione’, Colonel Erik Berdy, Commander of the US Army garrison in Italy, emphasized the importance of this base. The logistics base, situated between Pisa and Livorno, constitutes the largest US arsenal outside of the home country. The Colonel did not specify what the content of the 125 bunkers of Camp Darby may be. However, it may be estimated at more than a million artillery projectiles, airborne bombs and missiles, to which should be added thousands of tanks, vehicles and other military material. It can not be excluded that in the base there may have been, there are, or there may be nuclear weapons in the near future. Camp Darby, claimed the Colonel, plays a key role by supplying US land and air forces much faster than if they were supplied directly from the USA. The base supplied most of the weapons used for the wars against Iraq, Yugoslavia, Libya, and Afghanistan. Since March 2017, with huge ships that make monthly stops at Livorno, the weapons from Camp Darby are continually transported to the ports of Aqaba in Jordan, Jeddah in Saudi Arabia and other Middle Eastern ports in order to be used by US and allied forces in the wars in Syria, Iraq, and Yemen. On its maiden voyage, in April 2017, the ‘Liberty Passion’ off-loaded 250 military vehicles and other material in Aqaba. Among the weapons which are transported monthly by sea from Camp Darby to Jeddah, there are also, without any doubt, US airborne bombs that are used by the Saudi air force to massacre civilians in Yemen (as proven by photographic evidence). There are also serious indications that in the monthly link between Livorno and Jeddah, these huge ships also transport airborne bombs, supplied by Rwm Italia in Domusnovas (Sardinia), to Saudi Arabia for the war in Yemen. With the increased transit of weapons from Camp Darby, the canal and land routes from the base to the port of Livorno and the airport at Pisa are no longer sufficient. Consequently, a massive reorganisation of the infrastructures has been decided (and confirmed by Colonel Berdy), including a new railway. The plan calls for the felling of 1,000 trees within a protected zone, which has already been approved by the Italian authorities. But that’s not all. When Eugenio Giani (Pd), the president of the Tuscan Regional Council, received Colonel Berdy, he agreed to develop « the integration of the US military base of Camp Darby into the neighbouring community ». This is a position substantially shared by the mayor of Pise Conti (Lega) and also by the mayor of Livorno (Movimento 5 Stelle). The latter, in order to welcome Colonel Berdy, and then US ambassador Lewis M. Eisenberg, raised the ‘star-spangled banner’ on the Town Hall.